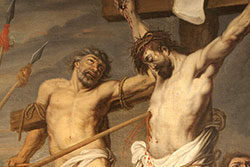 The Penitent Their, also known as the Good Thief or the Thief on the Cross, is on of the two unnamed persons mentioned in a version of the Crucifixion of Jesus in the New Testament. In the accounts in the Gospel of Mark and Gospel of Matthew, these two join the crowd in mocking Jesus. The Gospel of Luke describes one asking Jesus to “remember him” when Jesus will have “come into” his kingdom. The other, as the impenitent thief, asks Jesus why he cannot save himself.